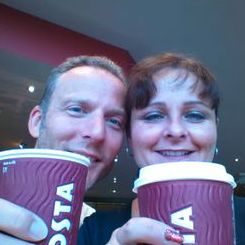 Marcus and Claire enjoying their first Costa - giving up coffee for the month raised over £1,000 for Dawgust! More dogs making their way from Ireland (due to arrive early hours of next Sunday morning - thanks for getting up Kristie and James). Lily, black lurcher, just had puppies, Denzel, tan lurcher (both around a year old) and Saffie brindle greyhound. All need to be neutered so will not be available for a few weeks. A massive, massive thank you to everyone who has contributed to the DAWGUST Appeal this year. The funds raised will go to help our very good friend Eila in Ireland. We cannot believe that we have exceeded the total raised last year, which was £7,123.21. Give yourselves a big pat on the back as the final 2016 DAWGUST figure (including Gift Aid) is an amazing £7,875.59. Thank you to so many people who worked so hard to help raise funds. You are all fabulous and we are so proud to have such greyt support. 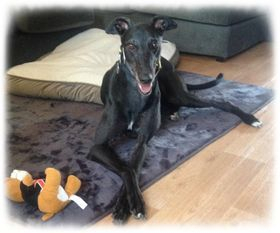 Brilliant news, our adorable Murphy has found his forever sofa with Karen, Jon and the lovely Saffie (a beautiful black greyhound girl - they really are a matching pair). Murphy is now known affectionately at the local park as "Murphinator" due to his amazing muscles!! We would like to thank Jess and Andy who very kindly fostered Murphy whilst he was waiting for a new home - you did a brilliant job. Be happy big boy - you have landed on all four paws. We would like to thank Dave, Lynne and Barbara for attending the Warminster Carnival Fun Day today, it was a lovely day and they raised an amazing £151.90. I received a cheque in the post yesterday that has left me both stunned and humbled. 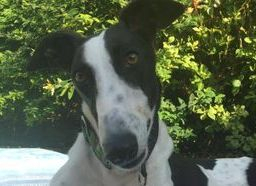 Bristol DAWG and their supporters chose irish greyhounds as their charity.for Dawgust. They collected a whopping amount that.far exceeded all expectations. I cannot thank each and every one of you who donated, collected, did sponsored events and auctions. To Gerry, Colin, Hilary and all the other trustees, neither I nor the dogs will ever be able to thank you enough. 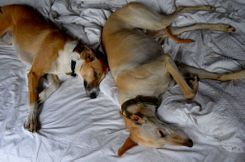 To the girls at kennels who get up in the middle.of the night to receive the dogs, thank you. To every person who.fosters or opens their hearts and homes and adopts an irish greyhound, thank you. The money raised will save many more greyhounds and lurchers and from them and me, past, present and future, thank you for helping us. A nice way to end the week. 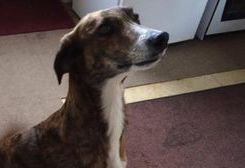 Rupert has found his forever home in Cornwall with Jenice, George and their very handsome brindle greyhound, Marney. Rupert came to Bristol DAWG as his owner became very poorly, she was heartbroken at having to rehome him, but knew she had to do what was best for Rupert. Thanks to Jane and Norman for the first week of his foster, and also to Jess and Andy for the following two weeks, as Jane and Norman were away - it would have been sad for Rupert to go to kennels having known home life, but as always our lovely people are always willing to help when needed. Enjoy your new life in Cornwall Rupert and we will make sure your previous mum knows you are happy. 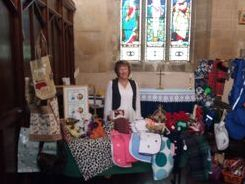 Thank you to Jan Lazenby for very kindly undertaking a table top sale on Saturday at St Peters Church, Frampton Cotterell, she raised £38.50 to help the dogs in our care, we are extremely grateful. It is with a very heavy heart that I have to break some sad news. One of our much loved friends passed quietly away late this afternoon in Southmead Hospital following a short illness. Gerry Quick was known by many of you and had a heart of pure gold, she would do anything to help anyone she could. We first met Gerry when she adopted Izzy from us quite a few years ago, since then she has collected bedding for the kennel dogs, knitted hundreds of greyhounds, helped with advertising events, run a stall at shows – Hoop-a-Hound was her speciality!! - such a good friend to Bristol DAWG, who will be sorely missed. We will remember her with affection; she was an amazing woman who stayed strong right until the end. Our condolences to her husband Colin, her daughter Jay and her hound Izzy. Some good news today, Gerry spent an hour this morning with Barbara and Chris to make Charley's adoption final. 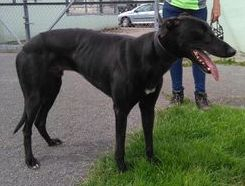 Charley has been on a two week home trial as Barbara and Chris have another greyhound called Violet. The two girls are getting on really well and have become good friends over the last couple of weeks. 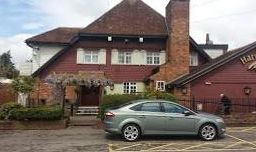 Massive thank you to Matt, Manager of The Snuff Mill Harvester in Frenchay for very kindly donating the monies collected in the fish pond. There was an amazing £238.12, which we are extremely grateful for. We must also thank Megan and Kim as they were the ones that told Matt about Bristol DAWG and collected the money - lots and lots of 1p, 2p and 5p's not sure how Megan managed to carry the buckets!! Today has been a very difficult day as we said goodbye to our very good friend, Gerry Quick. Gerry would have loved the service as it really did celebrate her life. 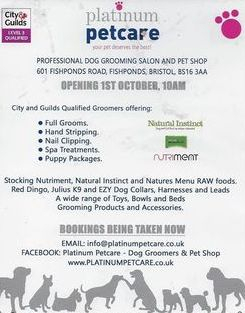 She was an amazing, kind lady who will be greatly missed by everyone at Bristol DAWG, both two legged and four!!! - especially with her endless supply of treats, which the dogs always looked for. Colin and Jay asked that instead of flowers, donations be made to Bristol DAWG. People were very kind and we have received donations of £325. Gerry will be looking down on us smiling I am sure, whilst looking after all our dogs who are already at Rainbow Bridge. Many thanks to our dear friend Wendy and Sarah's friend Daphne for their recent kind donations. We were delighted to welcome two new dogs, both girls into the kennels in the early hours of this morning. Thanks as always go to Kristie and James for getting up at silly o'clock to settle them into their new quarters. Details will be published on the "Dogs for Adoption" page when we have had a chance to assess them. 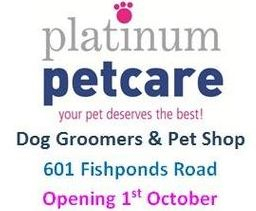 Starting from October, we will be reintroducing the "Dog of the Month" page on the website. First up will be the devastatingly handsome Dylan and you will be able to check him out in the section entitled "The Dogs". Let's hope it will help him to find the thing he wants most in the whole world - his own forever home.